Ban Chiang (Thai: บ้านเชียง), denotes an archeological site located in Nong Han district, Udon Thani Province, Thailand. Discovered in 1957, the Ban Chiang Archaeological site attracted enormous publicity due to its distinctive red painted pottery. During the first formal scientific excavation in 1967, archaeologists unearthed several skeletons, together with bronze grave gifts. Rice fragments have also been found, leading to the belief that the Bronze Age settlers probably had been farmers. The site's oldest graves absence of bronze artifacts led archaeologists to conclude that the site dates to the Neolithic period; the most recent graves date to the Iron Age. The dating of the artifacts using the thermoluminescence technique resulted in 4420 B.C.E. - 3400 B.C.E. dates. That positioned Ban Chiang as the earliest Bronze Culture site in the world. Radiocarbon tests in the 1970s revised that date to 2100 B.C.E. to 200 C.E. The dispute continues, although the majority of archaeologists have accepted the later radiocarbon dating. Regardless, the importance of the Ban Chiang site to discovering the roots of the people of Thailand, and human beings, remains firm. UNESCO's designation of the Ban Chiang Archaeological Site as a World Heritage Site in 1992 highlights that importance. Prehistoric Thailand traces back as far as 1,000,000 years ago based on the fossils and stone tools found in northern and western Thailand, and an archaeological site in Lampang, northern Thailand. Archaeologists discovered the Homo erectus fossil, Lampang Man, dating back 1,000,000 – 500,000 years. The stone tools have been widely found in Kanchanaburi, Ubon Ratchathani, Nakhon Si Thammarat, and Lopburi. Those regions have given up cave-paintings dating 8,000 B.C.E. Early Stone Age. The Lower Palaeolithic constitutes the earliest subdivision of the Palaeolithic or Old Stone Age beginning approximately 2.5 million years ago, when the first craft and use of stone tools by hominids appears in the archaeological record. The era concludes 120,000 years ago when important evolutionary and technological changes ushered in the Middle Palaeolithic period. Early species. The earliest hominid, Homo erectus, appears in the archaeological record, dating from 1,000,000 - 500,000 years ago. Lampang Man typifies the Homo erectus fossil discovered. Homo erectus moved into Asia from Africa, where it had originated, learning to control fire to support the hunter-gatherer method of subsistence. Homo erectus's skull had been smaller and thicker than modern human beings. He lived in the mouth of caves near the streams. His main natural enemies included the Giant Hyena Hyaena senesis, the Sabre-toothed Tiger, the Orang-utan, and the Giant Panda. In 1999, Somsak Pramankit found skull fragments of Homo erectus in Ko Kha, Lampang, comparable to a model skull of Sangiran II Man found in Java (Java man), dating 400,000 - 800,000 years old, as well as Peking Man. Relation to modern Thai people. Any connection between the modern Thai and Lampang Man as descendants had been considered mere speculation until recently. Modern genetic research has advanced a hypothesis that a connection does, indeed, exist. A recent study undertaken by geneticists reveals a lack of evidence that inter-breeding between modern human immigrants to Southeast Asia and Homo erectus occurred, affirming that the Thai descended from Africans in accordance with the Recent single-origin hypothesis. New Stone Age. The Neolithic or "New" Stone Age designates a period in the development of human technology traditionally considered the last part of the Stone Age. The Neolithic era follows the terminal Holocene Epipalaeolithic periods, beginning with the rise of farming, which produced the "Neolithic Revolution" and ending when metal tools became widespread in the Copper Age (Chalcolithic) or Bronze Age or developing directly into the Iron Age, depending on geographical region. Domestication. Neolithic culture appeared in many parts of Thailand, Mae Hong Son, Kanchanaburi, Nakhon Ratchasima, Ubon Ratchathani around 9000 B.C.E. People pioneered wild cereal use, which then evolved into traditional farming. Early Neolithic farming had been limited to a narrow range of crops, both wild and domesticated, which included betel, bean, pea, nut, pepper, cucumber and domesticated cattle and pigs. 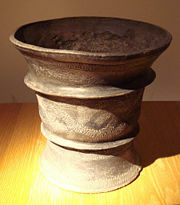 The period marked the establishment of permanently or seasonally inhabited settlements and the use of pottery. In Southeast Asia, the independent domestication events led to their own regionally-distinctive Neolithic cultures which arose completely independent of those in other parts of the world. Spiritual Cave. Spirit Cave (Thai: ถ้ำผีแมน) designates an archaeological site in Pang Mapha district, Mae Hong Son Province, north-western Thailand. The Hoabinhian hunter and gatherer from North Vietnam occupied the area from 9000 B.C.E. until 5500 B.C.E. Spirit cave dates to the Neolithic or New Stone Age, a period in the development of human. The site, located at an elevation of 650 meters above sea level on a hillside, overlooks the Salween River. Wang Bhodi. Wang Bhodi (Thai: วังโพธิ), the name for an archaeological site in Saiyok district, Kanchanaburi Province, western Thailand, dates from 4500 B.C.E. till 3000 B.C.E. Many stone tools have been found in the caves and along the Rivers in that region since World War II. Copper and Bronze Age. The Bronze Age denotes a period in the civilization's development when the most advanced metalworking consisted of techniques for smelting copper and tin from naturally occurring outcroppings of ore, and then alloying those metals in order to cast bronze. Claims of an earlier appearance of tin bronze in Thailand in the fifth millennium B.C.E. surfaced during excavation of the Ban Chiang site. Ban Chiang Dating. 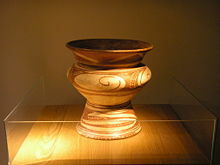 The first dating of the artifacts using the thermoluminescence technique resulted in a range from 4420 B.C.E.-3400 B.C.E., which would have made the site the earliest Bronze Age culture in the world. Excavations in the 1974 and 1975 unearthed items suitable for radiocarbon dating. According to the radiocarbon dating tests, the earliest grave has been dated around 2100 B.C.E., with the latest about 200 C.E. Bronze making began circa 2000 B.C.E., as evidenced by crucibles and bronze fragments. Bronze objects include bracelets, rings, anklets, wires and rods, spearheads, axes and adzes, hooks, blades, and little bells. The radiocarbon dating has called into question the long held belief of Ban Chiang dating to the Neolithic age. Artifacts Smuggled. The site again made headlines in January of 2008 when several California museums had been found to possess numerous artifacts illegally purchased. The plot involved smuggling the items to the country and then donating them to the museums to claim large tax write offs. Reports indicated that the museums housed more items from Ban Chiang than remained at the site itself. High profile police raids brought the scheme to light after a National Park Service agent had posed under cover as a private collector. The artifacts will be returned to Thailand. Black ceramic jar, Ban Chiang culture, Thailand, 1200-800 B.C.E. Current Discussion. An article by Chester Gorman and Pisit Charoenwongsa, claiming evidence for the earliest dates in the world for bronze casting and iron working, followed the excavation at Ban Chiang in 1974 and 1975. That led to an at times acrimonious debate between those who accepted those dates, and those who rejected them. Subsequent excavations, including that at Ban Non Wat, have shown as unsupportable the proposed early dates for Ban Chiang. Secondary literature still repeats the early claims. The date of 2100 B.C.E. was obtained by Joyce White on the basis of six AMS radiocarbon dating crushed potsherds containing rice chaff temper and one on the basis of rice phytoliths. The potsherds came from mortuary offerings. This method of dating is now known to be unreliable, because the clay from which the pots were made might well itself contain old carbon. Specialists in radiocarbon dating now discourage use of this dating method. A new dating initiative for this site has been undertaken by Thomas Higham of the AMS Dating Laboratory at Oxford University, in conjunction with Charles Higham of the University of Otago. This has involved dating the bones from the people who lived at Ban Chiang and the bones of animals interred with them. The resulting determinations have been analyzed and the results reveal that the initial settlement of Ban Chiang took place by Neolithic rice farmers in about 1500 B.C.E., with the transition to the Bronze Age about 1000 B.C.E. These dates are a mirror image of the results from the 76 determinations obtained from a second and much richer Bronze Age site at Ban Non Wat. The mortuary offerings placed with the dead at Ban Chiang during the Neolithic and Bronze Ages were in fact, few and poor. The Iron Age designates the age in which people used iron tools and weapons. People made tools from bronze before they figured out how to make them from iron because iron has a higher melting point than bronze. The adoption of iron often coincided with other changes including development of agricultural techniques, religious beliefs and artistic styles. Archaeological sites in Thailand, such as None Nok Tha, Lopburi Artillery center, Ong Ba Cave and Ban Don Ta Phet show iron implements in the period between 3,400 - 1,700 years ago. None Nok Tha (Thai: โนนนกทา) designates an archaeological site in Phu Wiang district, Khon Kaen Province, northeastern Thailand, dating from 1420 B.C.E. till 50 B.C.E. Lopburi Artillery center (Thai: ศูนย์กลางทหารปืนใหญ่) refers to an archaeological site in Mueang district, Lopburi Province, northeastern Thailand, dating from 1225 B.C.E. till 700 B.C.E. 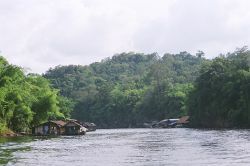 View of the Khwae Noi River. Ong Ba Cave (Thai: องบะ), an archaeological site in Sri Sawat district, Kanchanaburi Province, western Thailand, dates from 310 B.C.E. till 150 B.C.E. Ban Don Ta Phet (Thai: บ้านดอนตาเพชร) refers to an archaeological site in Phanom Thuan district, Kanchanaburi Province, western Thailand, dating from 24 B.C.E. till 276 C.E. The area of Phanom Thuan had already been occupied since prehistoric times. At the archaeological site of Ban Don Ta Phet, many artifacts had been found in a fourth century cemetery, which prove trade relations with India, Vietnam and the Philippines. ↑ Steve Olson, Mapping human history: discovering the past through our genes (Boston: Houghton Mifflin, 2002), 130-131. ↑ Robert Boyd and Joan B. Silk, How humans evolved (New York: Norton, 2002). ↑ Chester Francis Gorman, "Prehistoric research in northern Thailand: a cultural-chronographic sequence from the late Pleistocene through to the early recent period," World Archaeology (1971) 2:300-320. ↑ Charles Higham and Rachanie Thosarat, Prehistoric Thailand: from early settlement to Sukhothai (Bangkok: River Books, 1998), 84-88. ↑ C.F.W. Higham and T.F.G. Higham, "A new chronological framework for prehistoric Southeast Asia, based on a Bayesian model from Ban Non Wat" Antiquity 82 (2009):1-20. Gorman, Chester Francis. Prehistoric research in northern Thailand: a cultural-chronographic sequence from the late Pleistocene through to the early recent period. World Archaeology 2 (1971):300-320. All links retrieved March 27, 2016. Homo erectus fossils found for first time in Thailand. This page was last modified on 27 March 2016, at 16:47.